Is VLO An Acronym For Volatility? Valero’s on the top of the heap with a 365-day gain exceeding 57 percent. Compare that to the S&P’s contemporaneous price appreciation of 14 percent. The reason Valero isn’t a refuge? Volatility. There’s plainly more price variance in the oil stocks. 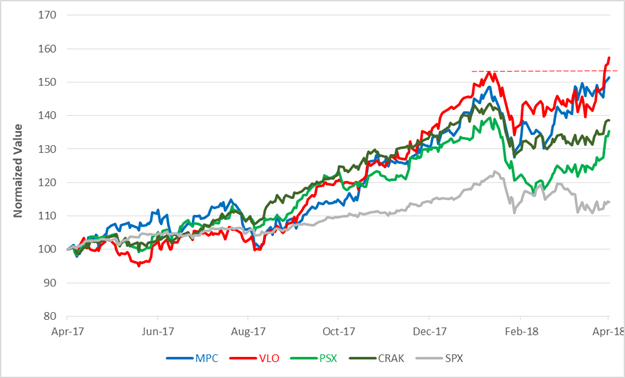 Among the refiners, the winner of the volatility derby is Marathon Petroleum Corp. (NYSE: MPC) with a standard deviation exceeding 21 percent. Valero weighs in at less than 20 percent while the S&P 500 churn rate is just 12 percent. Valero, like Marathon and Phillips 66 (NYSE: PSX), is an S&P 500 component. Over the past year, most of Valero’s price movements – represented by its r-squared (r2) coefficient – could be explained by the S&P index trajectory. That correlation seems to be loosening now. Among the major independent oil refiners, only Valero has staged a definitive upside breakout during the S&P 500 stumble. The company’s stock price just poked above the $100 level and is now aiming for a long-term technical objective of $124. What do I mean by long-term? Well, the last $24 hike in Valero’s price took just six months, but that was during the broad market’s recent euphoric run-up. It’s likely the oil refiner’s stock will need more time than that to reach its target – if it reaches its target – without the broad market at its back. Oil’s Slump: Boon Or Bust For Refiners?